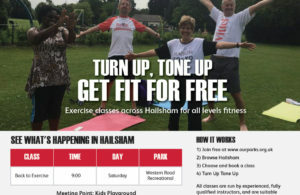 A free exercise class scheme launched last year by Hailsham Active in partnership with the Town Council and Our Parks, continues to benefit people and has inspired the local community to get active and improve their health into the bargain. Since being awarded £5,000 funding by the London Marathon Charitable Trust as part of the Active Spaces programme delivered in partnership with Fields in Trust, Hailsham Town Council has since worked with project partner Hailsham Active (formerly Hailsham & District Sports Alliance) and Our Parks to deliver and operate the Hailsham Active scheme, inspiring the local community to get active and take part in exercise programmes on the site which is now legally protected for future generations to enjoy. Launched in April 2018, Hailsham Active has provided free and easy access to low-impact exercise at the Western Road recreation ground on Saturday mornings for people of all ages. The group has grown in recent months and has launched new sessions at the James West Community Centre (Tuesdays from 6.30pm to 7.30pm / Saturdays from 9am to 10am and 10am to 11pm) and Herstmonceux Surgery (once a week), and in the spring, it is anticipated that more exercise classes will be added at other locations in the town, starting with Hailsham Country Park. Exercise sessions are led by experienced, fully qualified and insured instructors and include a range of classes such as yoga, pilates, back-to-exercise and gentle exercise. To join and book a space, visit www.ourparks.org.uk. Exercise classes are free of charge for the first four weeks. Thereafter, a voluntary contribution of £2.50 per session will be introduced. To find out more contact Steve Wennington 07980 643827 or email Andreaattilane@gmail.com.